Sultry tones of pink, seductive smells and sparkling bursts of white upon opening. An avalanche often occurs on a fairytale day that ends in violence. That's why this peony surely honours its name: soft petals on the outside, but once you get to the heart, you will find exuberant pink shades. 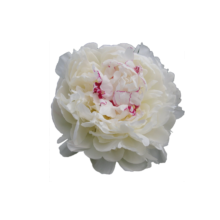 Avalanche is a peony that has been on the market for a very long time. Sadly, many growers quit growing her because of her sensitivity to blemishes. Since then, she has been refined and better than ever now.